Lovely 2 bedroom, 2 bath condominium in gated Heritage Oaks Golf & Country Club located just 15 minutes from the beautiful and world famous Siesta Key Beach in Sarasota, Florida. Enjoy full golf and country club privileges at the 18-hole championship golf course. Walk to the beautiful country club which features a wonderful gourmet dining room serving lunch, dinner, and Sunday brunch. In addition, there is membership reciprocity at over 40 other area courses from May through September. The club also features acclaimed golf professionals to assist you with your game, 4 lighted tennis courts, 5 heated swimming pools, jacuzzi, a fitness center with on-site fitness director, saunas, book and bridge clubs, theater groups, and dinner dances. Only minutes to downtown Sarasota, St. Armands Circle, Longboat Key, Siesta Key, Asolo Theater, Sarasota Square Mall, Outlet Malls, and the world famous Ringling Museum. Condo is in excellent condition with cathedral ceilings and tastefully decorated furnishings and appliances. Enjoy picturesque views of the lovely lakes and golf course from your private screened balcony. Enjoy the privacy of your own 1 car garage with automatic door opener for your automobile. We encourage you to make your reservations as soon as possible as availability is limited. 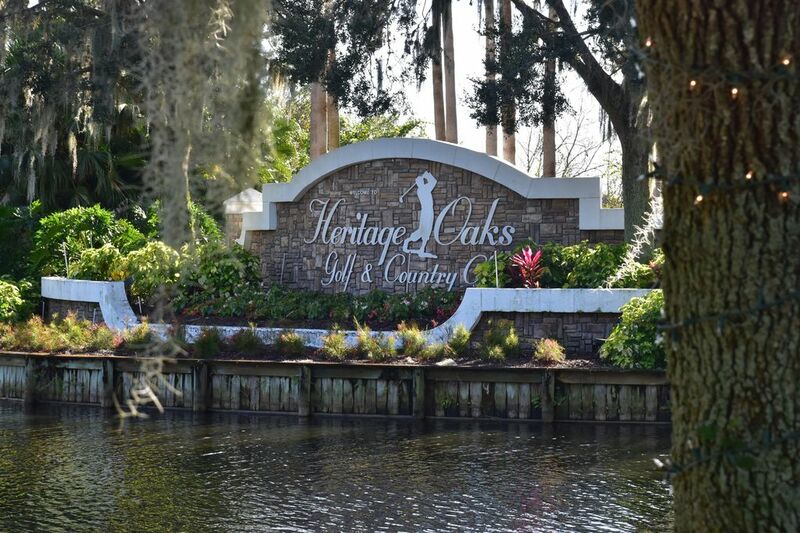 Our condo is beautifully situated on the signature hole (the 14th) of the Heritage Oaks golf course with scenic views of the water which borders the fairways of this lovely hole. In addition to the single car garage, there is ample parking throughout the community. Our fitness center has state-of-the-art equipment for those who want to live a healthy lifestyle. Secure WiFi is available in the condo. Screened patio overlooking the 14th hole of the golf course. Four Har-Tru courts await those who love tennis with a well-structured program for the most avid players, as well as novices. There are also men's and ladies tennis leagues available to join. Five pools are located throughout the community. Enjoy the spa or participate in a Water Workout class at the Clubhouse Pool, or relax at one of the community pools. Cable TVs (HD tv) in Living Room and Master Bedroom. Full Kitchen with microwave, ice maker and all cooking utensils provided. Phone with answering machine. Garage with automatic door opener. Crib and High Chair available upon request. our experience and time spent were very good. We had a great time at this condo. So quiet and peaceful. The condo is turn key ready. Everything was well taken care of and the owner was quick to respond to emails. Heritage Oaks is a great community. If your a golfer the course is well taken care of and there are a lot of activities at the club house. And the food is delicious. Great rental. Quiet & perfect area for retirement age people. 2nd yr. we have stayed here. We will be back, in fact we are already booked for next season. Everything you could want or need is in here. Retired couple was very comfortable here. Golf, pools, Bridge, cards games all in this locale. Siesta Key beach is a 15-20 minute ride away. wide variety of entertainment nightly. Nice view on 2nd floor. Well stocked kitchen equipment. Use of our condo within Heritage Oaks Golf & Country Club allows the tenant full privileges to the club and all of its facilities (golf, tennis, fitness, pools, dining room, etc.). There is a $200 fee ($50 for rentals from May 1 - October 31) payable by you directly to Heritage Oaks upon your arrival to register you as a member ($300 for rentals of 2 or more months). As a "transfer member", you are then entitled to full golf privileges and are able to make your tee times through the Chelsea Tee Time reservation system. Golf green fees are currently $42 (18 holes with cart) or $21 (9 holes with cart). (Amounts shown are for 2019 and are subject to change). Upon check-in with the Membership office, all Tenants are required to provide an initial $500.00 deposit long with an impression of a Visa or Master card. The initial $500.00 deposit will be applied for charges against the Tenant's sub account for food & beverages, golf fees, merchandise, fitness & any other miscellaneous purchases. When the Tenant’s sub account charges reach the initial $500.00 deposit, an additional $500.00 deposit will be charged to their credit card. Approximately 14 days after the conclusion of the Tenant’s rental period, any balance on their sub account, debit or credit, will be applied accordingly to their credit card. Rates are subject to change until reservation is confirmed.